Delivering effective medical care demands the full attention of the doctor or medical professional providing the treatment. You expect your doctor to be completely focused on you when you’re being treated. Unfortunately, that is not always the case – some doctors are distracted. Instead of focusing on you, the patient, their attention might be on their smartphone or other mobile device. Distracted doctoring can be compared to distracted driving – they both can result in devastating consequences. Distracted doctoring can lead to mistakes such as surgical errors, medication errors, or some other catastrophic error. What is distracted doctoring? It is when physicians are preoccupied with technology, such as cell phones and texting, at the expense of patient care. This distraction can cause grave medical errors to be made. While many work to educate the public on the dangers of trying to drive a motor vehicle while using a technological gadget, what about distracted doctoring? The use of portable electronic devices, such as smartphones and tablets are driving the attention of health professionals away from their patients – even in the operating room where they need to be focused on patient monitoring. While technology has the ability to improve patient care, it can also hurt patients if the doctors end up more focused on their devices than providing the best care to the person in front of them. The New York Times went on to mention that some hospitals are restricting the use of smartphones, iPads and other devices, to avoid an emerging phenomenon called “distracted doctoring”. At any given moment, you can see a number of hospital staff texting, surfing the net, or using social networking sites when they should be giving their patient the care they deserve and need. Although cell phone usage can enhance communication in hospitals between doctors, nurses, and other workers, the potential for overuse and/or misuse has become more apparent – as the potential for patient harm has surfaced. More and more studies show that multi-tasking can end up making a person do everything badly at once instead of completing each task methodically and successfully. Unfortunately, distracted doctoring is more common than people might think. Does your doctor type while you talk? How do you feel about that? 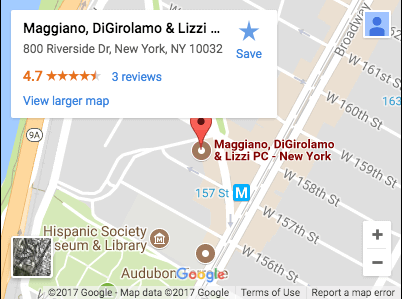 If you or a loved one was injured due to a distracted doctor, contact the personal injury law offices of Maggiano, DiGirolamo & Lizzi. We have successfully handle all types of medical malpractice cases, and are prepared to investigate and pursue compensation for you. Call us today to meet with one of our award winning attorneys for a free initial consultation. We are conveniently located in Fort Lee, New Jersey.